In this episode, you’ll learn what’s so great about Britain, and how guest Gavin Landry targets potential visitors by tapping into what they love about travel. Gavin Landry serves as Executive Vice President for the Americas for VisitBritain. Gavin has a strong background in business and leisure tourism and has held several senior posts in the industry. Prior to joining VisitBritain, Gavin worked for New York State, where he was Executive Director of Tourism, having led the iconic I Love New York program, and where he developed and implemented strategies to support the growth of the tourism industry. During his tenure at I Love New York, Gavin, and his team increased visitation to New York State by 40 million and set a program record the total economic impact of $100 billion. Thank you for joining me, Gavin. It’s great to be here, Nicole. I’m really excited to have you back and to hear what you’re doing in your new role. Can you share with our listeners a little bit about what you are doing with VisitBritain, and maybe some of the differences and similarities that you’ve found in transitioning to your new role? Sure. That’d be great. It’s wonderful to be back on the show with you, Nicole. I haven’t lost track of you, by the way. I really have enjoyed many of the episodes, particularly the one with Rick Antonson, from Vancouver. He talked about something called cathedral thinking, which I found fascinating as it related to a kind of building for the near future, but also the long-term future, with all of your efforts and all of your thinking. So, a big shout out to Rick, and to the cathedral thinking crowd out there, because we’re right with you. It’s been a big change. It’s been a wonderful experience joining VisitBritain. Ironically, much of the challenge that we have with Britain is similar to the challenge that we had with New York State, with I Love New York. We, with I Love New York, wanted to have people do New York City plus. So, New York City plus the Adirondacks. New York City plus the Finger Lakes. New York City plus Long Island, and so on and so forth. Well, now with Great Britain, it’s all about London plus. We want people to experience London, but also experience the rest of the regions of Great Britain, so we’re actively promoting destinations beyond London, all the way through Scotland, Wales, Northern Ireland, places to go that you can have really wonderful experiences in Great Britain, that folks might not think about initially when they think about what it means to travel there. Ok, let’s dive in. Can you talk a little bit about how VisitBritain really stands out from the crowd, and what you’re doing to help that? Sure, I’d be happy to. My role is to look after the whole of North and South America, driving inbound visitation to the U.K., and showcasing the tourism products and experiences that you can only find in Great Britain. We have offices in Sao Paolo, in Los Angeles, in Toronto, and here in New York City. That’s our footprint. But then we also look after other markets, such as Argentina and Mexico and other places, where we see opportunities emerging that will be of benefit to increase the visitor economy in Great Britain. That’s sort of how we’re set up. Now, when it comes to kind of creativity and how we stand out from the crowd, it’s really interesting, because we just launched our “I Travel For” campaign, which is a platform that really is consumer-centric, tapping into consumers’ emotions about their passions for travel. It’s a bit of a step away from place-based, destination-type marketing. Where, instead of looking at a destination, per se, or an individual attraction, we’re really looking at what it is that drives the traveler experience, and setting passion points for those experiences, that we then amplify to the audience here in the Americas. Hats off to our London team, and to the whole global network, which at this point stands as 21 offices across the world, including the team in London. So, we’re quite a big operation, organization, and to roll out this “I Travel For” campaign has been a lot of fun, taking this new approach. That’s great. I’ve seen I Travel For, actually, on social already, so I know that that’s been rolled out. But my question is, you talked about trying to get the consumers to share more of their emotional connection. Is that what you’re talking about? And in what ways do they do that? How does that present itself in this platform? Sure, yeah. 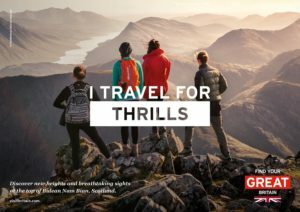 We did extensive consumer research and data-driven thinking, relative to what is the best way forward for VisitBritain, to drive that visitation throughout the whole of Great Britain. We arrived at different passion points for each market. For instance, the U.S. has six passion points. I can certainly send you more information on this, but it’s Thrills, Bliss, Stories, Local Flavor, Characters, and The Undiscovered. So, I Travel for Thrills. I Travel for Bliss. I Travel for Stories – and then we’re aligning those passions with unique experiences – Unexpected experiences, in many cases – from Britain. For instance, what we know from the research we’ve done on the American audience is that we have still work to do to drive awareness, consideration, and perceptions of Britain as a place to go now, a place that’s dynamic, and a place that is where you’re going to find the unexpected. You wouldn’t find that the entire mass of the U.S. audience would know that in Bristol you can take a Banksy walking tour, and see some of Banksy’s early work still adorns the streets of this lovely college town. You may not know about the South of England, where there’s a whole wine industry that’s emerging, primarily because some of the French wine producers are buying vineyards in the South of England, and producing incredible champagnes and wines. We’re doing similar things with Manchester, Birmingham, Edinburgh, and Glasgow, aligning those passion points with those particular consumer-centric ideas, and then demonstrating how you can find something that’s only available to experience in Great Britain. That’s great. I love, first of all of course, that it’s data-driven, which I would expect nothing less. But then I like that you’ve identified these passion points, and they are identifying those experiences that align with those. How has the rollout been? Thank you. Well, we’re launched in the U.S. We’re launching across the globe. And of course, as you think about it, my good friend Travis Kwan in China has identified different passion points for the Chinese travel market. Likewise, in our Middle East offices, we would identify different passion points. So it is very adaptable. It’s really exciting, and we think that this is a way forward for VisitBritain that we’re going to keep in-market for some time to come. I’m wondering if you can share with us a challenge that VisitBritain may have faced or be facing, and then a creative solution that has resulted from that. Yeah, sure. You know, it’s very good news from the Americas, relative to what’s happening. The U.S. is now the number one long-haul inbound market for Great Britain. Just under four million visits from the U.S., Canada is approaching a million inbound, and the numbers from Brazil are tracking double digits ahead of prior years. So, we’re seeing really wonderful things happening from North and South America. But the challenge is really changing perceptions. That despite its name … You know, Britain is not great in size. Actually, Britain is quite easy to get around. Great in front of Britain makes you think that it’s a really big place, but in fact, you can be to London and to Wales in less than two hours. You can be London to Edinburgh about four hours, 20 minutes. Again, changing completely your space and your place, experiencing something wonderful in four hours, 20 minutes … That’s, I think, less time than it takes to fly from here to LAX in Los Angeles. A couple things coming up that I thought I’d share with your audience. 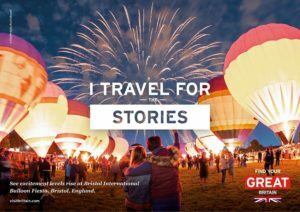 We have the 40th International Balloon Festival in Bristol. I mentioned that wonderful town already. The Edinburgh festivals, such as The Fringe and so on and so forth, and The Royal Tattoo. If folks aren’t familiar with The Royal Tattoo, look it up, because it is just quite a spectacle and something to experience. Liverpool is in their 10th-anniversary celebration of being named the European Capital of Culture, and in fact, has the Terracotta Warriors on exhibit this summer. Or spring and summer and fall, actually. So, that’s a wonderful thing to experience. If you haven’t been to China to see the Terracotta Warriors, you can see them while they’re on the road. Yes – so many reasons to travel! I want to back up and talk more about that word, “great.” It does suggest something very large in size, and maybe not as easy to navigate as what you just described in just talking about the rail product that you have there, and talking about how close everything really is. I can really see how changing perceptions on that will really go a long way. Yeah. It’s one of our primary objectives. Clearly, we want our secondary and tertiary cities to be as well-known as any other country. I mean, if you ask the U.S. audience, for instance, to name places in Italy, they’d probably be able to reel off seven, eight different places in Italy. We want that same thing for Britain, where folks are just as aware of all the wonderful destinations and places that we have throughout the whole of Great Britain, and then go and experience them. Yes, absolutely. What is the average stay for an American visiting Great Britain? It’s in the 7-day range. It really is interesting to see the differences across the globe, because Americans typically don’t have as much time for vacation as, say for instance someone potentially from Australia or from China, or other places around the globe, so we do have to adjust. I think that that plays into this whole idea of the ease of getting from point A to point B, and how much you can actually see and accomplish, especially if you are an American and don’t have as much vacation time to spend. That’s exactly right. Certainly, we do understand that there are lots of wonderful places to go in Europe, and we are very much in support of our European friends. We just want Great Britain to have its share of the travel experience. It’s amazing. When I travel, I’m just gobsmacked. Having the opportunity to go to new places in Great Britain, how the level and the quality of the destination, of the attractions, is so robust. It’s beyond … It really, you can’t express it. You have to experience it. I know we already talked about I Travel. I don’t know if you have another one to share that you’re working on in the coming months, that you’re really excited about. Well, we have lots. I’ll hit these quickly because I know the audience doesn’t want to listen to me just kind of droll on. But one of our primary initiatives as VisitBritain is we look to support new gateways and roots with airline partners. This is one of our primary initiatives. We do that in many, many ways, both physically in helping to promote these launches, but also in joint marketing efforts, and so on and so forth. This year alone in America, Norwegian is launching new routes from Chicago and Austin into Gatwick. Virgin is returning a seasonal San Francisco-Boston to Manchester route, another one of our great gateways. British Airways, American Airlines are launching from Nashville into Heathrow, and Primera is launching from Newark into Birmingham, another one of our great cities. Then, of course, there’s the royal wedding on May 19th at St. George’s Chapel and Windsor Castle. That’s something we’re very happy and focused on. We just launched some content for the first time with Time Incorporated, so if you happen to go on Travel + Leisure, Food & Wine, People Magazine, and InStyle, any of those properties, you might stumble across some of our content that we’re working on with Time Incorporated. Other things that we’re working on, Nicole. We’re collaborating with film studios. You know, film and TV are powerful motivators for travel. I think over a third of visitors to Britain want to visit places that they’ve seen onscreen. I am seeing that as a trend that is becoming part of the zeitgeist of the current traveling public. You know, that film and TV are incredible influencers and have to be looked at as part of the overall process. So, collaborating with the film studios on things such as that. And then, of course, our flagship event coming in October, is something we call Destination Britain North America, where we actually bring in buyers from all over the country, both U.S. and Canada, and we have suppliers come in from the U.K., and basically a speed-dating experience. A lot of training, product launches, things like that. So, an awful lot going on, on a number of levels. I wanted to back up and talk a little bit more about the social first approach that you’re using. So as you’re launching your campaigns, or as you’re pushing out new content, new messaging, you’re thinking about pushing it out first through a social media platform in some ways. Is that what you mean when you’re talking about social first? That’s right. What we’re mainly trying to do is with our content strategy is really reach audiences where they’re already consuming content, as opposed to necessarily kind of creating content, and then trying to hope that we can force-feed it into a channel. In partnership with our content tech partners, our brand partners, some of our commercial partners, we’re producing content that is in the proper tone of voice for their audience, in a native format, in a way that is native to the audience, so that it really does resonate. For instance, we have a partnership right now with National Geographic. National Geographic has a certain style and a tone of voice, and a way that they approach the production of content. So, we work with them to make sure that we’re reaching the audience in a manner that is most acceptable to them, and in one that will resonate the most. Then, of course, we are thinking always of driving conversions. You can’t just do the inspiration work. You have to have an eye towards a bookable product. You have to have an eye towards conversion. We’ll often then engage with those, or re-market it, to those that have engaged with content, with tactical offers, or things that may be of interest to them. Then it becomes, you’ve already raised your hand. You’ve self-selected. You’ve said, “You know what? I want to go to Scotland.” Because you engaged with the content on Scotland, and we’ll come behind with a tactical offer that then can get you to Scotland so that you can go to the Highlands, and you can have these magical experiences on the Isle of Aig, or wherever you may want to go. Fantastic. I would like to talk a little bit about collaboration. I can’t let you off this interview without at least exploring something on collaboration because it’s one of my favorite topics because I love all of the collaborations that happen. Probably the best example that I can give you, in terms of collaboration, is something called the Discover England Fund. This is a three-year, $40 million pound project to drive inbound visits. And really what this is, it’s an opportunity for people to bid, and make kind of bids into this fund, and develop a product that then would cause that dispersal and all of the things that I’ve talked about to happen. An example of that is something that I think is a really cool project, something called the Great West Way. This is a project for Visit Wiltshire, where Stonehenge is. We’re working with nine DMOs including Windsor, Bath, Somerset, Cotswold, to create a 125-mile touring route between London and Bristol. And of course, along that way, you’re near obviously Stonehenge, you’re near Bath, you’re near Oxford. There’s all kinds of ways that can be differentiated by tour operators, and by the destination marketing companies that are in Britain. Thank you so much, Gavin. This has been amazing. We’ll talk again soon.